You can add hundreds of cars to your game, says Shift 2: Unleashed's lead designer, but people will ignore most of them. 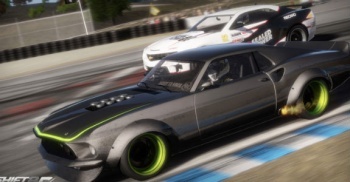 Andy Tudor, Shift 2: Unleashed developer Slightly Mad Studios' lead designer, has joined EA VP Patrick Soderlund in bashing the competition ahead of the release of their rival racing sim. Tudor attacked Gran Turismo 5 and Forza Motorsports 3, saying they were more like encyclopedias than games, and featured hundreds of "irrelevant cars." Slightly Mad's focus, he said, was on making the driving experience enjoyable, rather than including every variation of the 1986 Toyota Corolla. He thought that titles like Gran Turismo 5 encouraged people to grind races over and over to earn money to buy a new car, and then to go back and do it again for a new car. Tudor said that most people didn't tend to collect all the available cars in games like Gran Turismo or Forza. What actually happened, he said, was that most people had between 10-15 cars in their garages, usually made up of the first car they had, a car they have in real life, a dream car, then specific cars for different tiers or licenses and cars they just wanted to try out. For that reason, Slightly Mad wasn't going to include hundreds and hundreds of cars that people would never use. Instead, Shift 2 would have a smaller and more focused selection that covered the various types of car enthusiasm, like American muscle cars or Japanese tuner cars, without going overboard. EA has an uphill struggle with the Shift series, as its rivals have had much longer to go at it, but while it's refreshing to see a developer being so candid, Tudors comments about his rivals seem like they will do as much to harm Shift 2 as help it. There will be people - and considering we're talking about in-depth simulation games, there's likely to be a lot of them - who like the fact that GT5 and Forza 3 have a huge variety of different cars, and enjoy collecting them. Suggesting that there's something wrong with that probably isn't the best way to win them over. Shift 2: Unleashed is scheduled for release on Xbox 360, PC, and PS3 in Spring of next year.